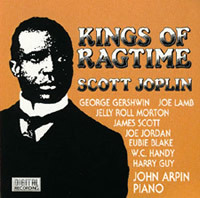 The greatest ragtime album of all time (in my opinion) is John Arpin’s "The Kings of Ragtime". To fall into the "greatest of all time" category for anything demands a superb musical performance and John delivers that. What I like most about the album is that Arpin has selected a broad spectrum of composers that significantly influenced the ragtime era. Composers include Joseph Lamb, James Scott, Eubie Blake and Scott Joplin among others. 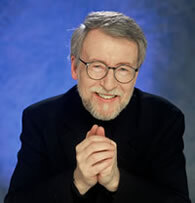 John Francis Oscar Arpin (3 December 1936 – 8 November 2007) was a Canadian composer, recording artist and entertainer, best known for his work as a virtuoso ragtime pianist. John starts the album off with Eubie Blake’s "The Chevy Chase" from 1914. Eublie Blake came to the Toronto Ragtime Society’s annual Bash just before he passed away. I remember John playing the Chevy Chase back in 1983 with the same energy he put into this recording. He follows that with some Scott Joplin rags and then a very classical rendition of Joseph Lamb’s Ragtime Nightingale. Eubie Blake pronounced John Arpin "the Chopin of Ragtime" and you will hear why on this tune. John then really mixes it up with George Gershwin‘s Rialto Ripples. Who knew Gershwin was into ragtime? He continues on with a variety of composers and then a two part rendition (blues/boogie) of W.C. Handy‘s "St. Louis Blues", a highlight of this album and of John Arpin’s concerts. Besides the St. Louis Blues, perhaps my favourite selection is William Bolcom‘s "Graceful Ghost". This modern day (1971) rag is so beautifully executed I would imagine that any pianist hearing it would add the Graceful Ghost to their bucket list of must learn songs. The Kings of Ragtime is one of those rare albums that you never tire of hearing because of its variety and top notch performance. I highly recommend this album to ragtime enthusiasts and welcome comments from you about your favourite ragtime albums! Many of you have heard of blind pianists like Ray Charles, George Shearing, Ronnie Milsap and Art Tatum but did you know there was a blind ragtime composer? Charles Hunter (1876-1906) was an American composer of ragtime music who was born almost totally blind. He attended the School for the Blind in Nashville, Tennessee, where he learned the piano tuner’s trade. He went to work at the Jesse French Piano Company in Nashville. Absorbing the folk strains of Nashville, he published his first rag, "Tickled to Death," in 1899, which became a hit. This was followed 1900 by "A Tennessee Tantilizer," and in 1901 by "Possum and Taters," "Cotton Bolls," and "Queen of Love." 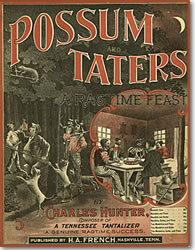 Of these fine rags, my favourite is the "Possum and Taters". It is quite different than a Scott Joplin rag in that it relies more on melody than rhythm. I find the prominent single note melody that Hunter uses similar in style to that of Earl Hines "trumpet-style" piano-playing made famous in 1928. The rag should be played with a clear statement of melody. The left hand should be present but slightly understated so as to not detract from the melody. Adding rubato, especially between strains, will give the piece a lilting character like a classical romantic piece. The piece sounds easier than it is to play properly, however, if you are a beginning ragtimer, this is a good introduction. Charles Hunter lived only 30 years and produced a handful of rags, but the Possum and Taters will be remembered as a delicate piece of folk ragtime, a pleasure to play and hear. The Nightingale Rag was published by Joseph Lamb in 1915. It is Classic ragtime at its finest. 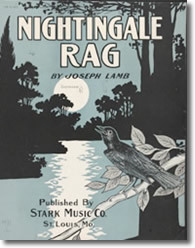 Note: The Illustration contains the name Nightingale Rag but the Sheet Music is titled Ragtime Nightingale. I first heard John Arpin perform the Nightingale Rag on CBC Radio some 25 years ago. I was moved by the lyrical beauty of the tune and Mr. Arpin’s interpretation. Joseph Francis Lamb (December 6, 1887 – September 3, 1960) was a noted American composer of ragtime music. Joseph Lamb was interviewed and recorded in his home August 12 and 22, 1959 on Folkways Record FG 3562. In that interview he says he was influenced by James Scott’s Ragtime Oriole so he thought he should be able to write about a Nightingale. He "borrowed" an 8 note bass phrase from one of the selections in The Etude magazine to begin his piece. He said he didn’t have the slightest idea of how a Nightingale sounded but he added some bird noises. He was particularly fond of some "bird" sounds he heard in Ethelbert Woodbridge Nevin’s Nightingale Song and used that as the introduction to the last strain. Like Joplin’s rags, the Nightingale is separated into strains but instead of the traditional 4 strains, Lamb used 3 strains, repeating the first strain as per usual but closed with the majestic second strain. The piece has a very classical sound and is more difficult to play than it sounds. Interestingly enough, it is now included in the piano syllabus for the Royal Conservatory of Music (Canada). “They all played the Maple Leaf Rag” is an album that both ragtime enthusiasts and those new to ragtjme will enjoy. There are 15 different interpretations of Scott Joplin’s 1899 Maple Leaf Rag, all recorded between 1907 and 1969. If you aren’t familiar with the original tune, I recommend listening to Ralph Sutton’s 1950 version first. Although none of the recordings on this album follow the sheet music score exactly, this is probably the most accurate. There are a variety of artists who have been captured here including Jelly Roll Morton, Willie the Lion Smith, James P. Johnson, Eubie Blake and my favourite, Sidney Bechet’s New Orleans Fleetwarmers with Bechet doing a killer job on soprano sax. Jelly Roll Morton also provides an interesting insight in the different ragtime styles that existed within America. He first plays it in the traditional Joplin style, popular in and around St. Louis and then in his own New Orleans style, quite different but equally as good. I recently saw an extended CD version of this album at David Jasen’s Archive Productions website. You don’t have to know anything about ragtime to appreciate this collection! Ragtime flourished from the mid 1890’s until around 1920. It was predominently sheet written music and was distributed before the days of recording. Pianos were as common as TVs are today so sheet music sales were huge. I play “Classical Ragtime”, a structured style developed by several composers including Scott Joplin, Joseph Lamb, Tom Turpin and James Scott. Although not the first rag written or published, Maple Leaf Rag did become the first instrumental piece to sell over one million copies The rag was named after the Maple Leaf Club in Sedalia, Missouri. Sales of Maple Leaf and subsequent rags earned Joplin his “King of Ragtime” reputation, and enabled the publisher John Stark to move his company to St. Louis, then later New York. Scott Joplin was the most famous ragtime composer. Scott Joplin lived from 1868-1917. He wrote many rags, marches, waltzes and even an opera. His music was featured in the 1973 movie “The Sting” including the song “The Entertainer” as well as many others. Ragtime is an American musical genre which enjoyed its peak popularity between 1899 and 1918. It has had several periods of revival since then and is still being composed today. Ragtime was the first truly American musical genre, predating jazz. It began as dance music in popular music settings years before being published as popular sheet music for piano. to accept the merits of each. Playing at the Holiday Inn for years and various tour boats have secured me with a broad repertoire covering styles like Pop, Rock and Roll, Jazz Standards, Ragtime and Boogie-Woogie. What is Boogie-Woogie? I maintain it was the precursor to the Rock and Roll that was popularized in the 1950s by Jerry Lee Lewis and Fats Domino and the like. Boogie-woogie is a style of piano-based blues that became very popular in the late 1930s and early 1940s, and was extended from piano, to three pianos at once, guitar, big band, and country and western music, and even gospel. Whilst the blues traditionally depicts sadness and sorrow, boogie-woogie is associated with dancing. I have performed at many functions in the Kingston area for over 20 years. I developed a love for Ragtime in 1982 when I became hooked on the Classic Piano Ragtime book by Rudi Blesh. I studied under John Arpin, Toronto’s great pianist and President of the Toronto Ragtime Society at the time. One of my highlights was playing for Princess Diana on her visit to Kingston in October 1991. I have worked several drummers in the past and I still work occasionally with Doctor Drums. I have been a member of the Ragtime Society in Toronto and the Kingston Musician’s Union Local 518. In 2009, I finished a 20 year gig as “The Ragtime Kidd” performing as the house pianist at the Holiday Inn Kingston, Ontario, Canada. I look forward to sharing my thoughts and appreciation for ragtime with all of you!